The Management and staff of Kia Country of Savannah is pleased to announce a new program that has been put in place as Kia Country of Savannah gives back to our community. The program has been titled “Pastor Appreciation Weekend” on behalf of the great work our pastors are doing in our community. 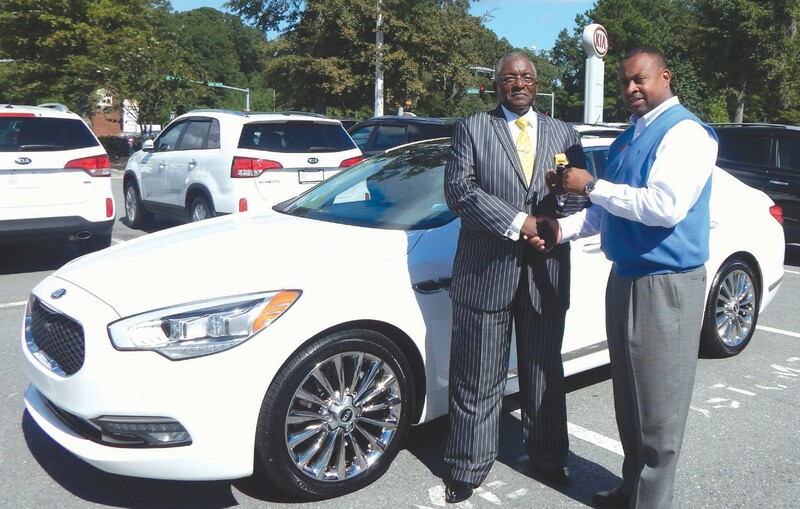 Kia Country of Savannah will allow a pastor in our community to test drive the new 2015 Kia K900 for the weekend as well as receive a Ruth Chris Gift Card for dinner. You can become a part of this program by logging on to Kia Country of Savannah’s facebook page and nominate your pastor to be selected during our Pastor Appreciation Weekend Celebration. The pastor selected for last weekend was Rev. Samuel Kenty, Pastor of Jerusalem Baptist Church on Baker St. and First Mt. Pleasant on Coffee Bluff Rd. The 2015 Kia K900, has a 5.0 liter, V8, 420 horsepower engine. Elegant style, balanced proportions, and advanced technology, the Kia K900 is everything you’ve ever wanted from a rear-wheel drive luxury sedan. From the generous wheelbase, prestige distance, and sweeping shoulder line, combined with superb interior craftsmanship and materials, the K900 redefines your perceptions of luxury. The Kia K900 has a quieter, smoother drive. It’s the luxury car certified to deliver a quieter cabin and a smoother, better overall ride than the Audi A8 4.0T, BMW 750i and Lexus LS 460. Featuring a foam-padded cabin for exceptional insulation, a high-strength steel structure, and a fully independent front and rear suspension, the K900 silences the road. For more information visit us at Kia Country of Savannah on Chatham Parkway.